Great Yorkshire Show is a wonderful day out in Harrogate, a great way to enjoy the countryside in North Yorkshire. The 2015 Great Yorkshire Show is scheduled to take place on 14th to 16th July 2015. If you are planning a trip to the Great Yorkshire Show or simply holidaying in North Yorkshire then we have put together a selection of self catering cottages, apartments, holiday flats and lodges below as well as some useful links to B&B's, guest houses and hotels to help you make the most of your stay in North Yorkshire. The Great Yorkshire Show is held at the Showground in Harrogate, North Yorkshire. The Main Ring will see the traditional Cattle Parade and International Show Jumping on each of the 3 days. It will also see the thrills and spills of the Scurry Championship and the majestic Heavy Horse Classes. The Garden Show has everything from the small and perfectly formed to the more imposing, exotic and larger exhibits that are bound to thrill the gardener and amateurs alike. For the more fashion and style conscious head to the Fashion Pavilion to see the latest in designer, and young designer, clothing and accessories. For some fun and learning how about heading to the Discovery Zone which is focusing on Environment, Healthy Living and th Countryside. So you can have a go at dry-stone walling, learn how to eat healthily and even find out more about renewable energy. Of course there is everything you would else you would expect of country's biggest Show... arts and crafts, competitions, cookery, livestock, hounds, rural country pursuits the list goes on and on. The Great Yorkshire Show is a brilliant family day out nad we would highly recommend it as part of a short break or holiday. Great Yorkshire Show can be found near Harrogate in North Yorkshire. Use the map control to zoom in or out. Please confirm the latest travel directions and details on the Great Yorkshire Show website. 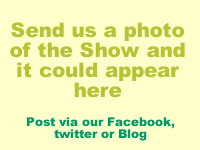 If you have been to Great Yorkshire Show we, and our visitors, would love to hear about it and see some pictures. Tell us about Great Yorkshire Show so you can help others decide.... is it worth going to, what were the best bits, how was the parking, would you do it again, would you recommend it? If you are a Great Yorkshire Show organiser and would like to add more information to this page it is completely free, we want nothing in return, just tell us about it via our Facebook page our Google+ page or our Wordpress blog and we will do the rest. If you are looking for some last minute North Yorkshire self catering apartment, flats or cottages then we recommend you call 0844 847 1143 for a great selection of properties and the latest availability and deals.